As we were just mentioning yesterday morning, we designated a pair of contracts to watch in the CNC chain toward the end of March, with the CNC 09/20 $50 & $55 Calls. Since that time the stock has been in a near-continual uptrend, and after yet another bullish session yesterday, we have new highs to report on our ideas. The $50 Calls have now traded in a range from 1.80-9.50, amounting to a total move of 428%. The $55 Calls have been on an insane run, and they have thus far traded up from .31-6.70. That works out to a rise of 2,061% in a span of only nine trading sessions. Weve got another options chain that we ‘d like to signal some longer term calls in as well. BPT fell off a cliff yesterday, and while it may have slightly further to fall before reversing, the chart shows a history of rapid recoveries whenever the stock is beaten back as it has been this week. We’re going to designate the BPT 05/17 $22.50-25 Calls as two contracts of interest and begin to track them over the days and weeks ahead. Twitter posted its quarterly figures showing the company was nearing profitability, so we took the opportunity to signal a range of options, and what followed was Twitter’s biggest bullish session since last year, and some great chances for gains in our designated contracts, the TWTR Weekly $18-19.50 Calls. *Never trade options with a weekly expiration on a Friday unless you’re an expert trader with disposable funds. It’s just about as risky as it gets. We’ve been tracking ITUS since September 21st, subsequent to which point we witnessed a really great move in the stock from 1.92-5.15 for gains of up to 168% over just a few sessions. In the past few weeks ITUS has been under consolidation, but yesterday the stock came down and kissed the 50DMA before bouncing. It’s gapping up this morning in the premarket, so we’ll want to watch closely for it to hold the 200DMA of 2.19 on any pullbacks. If it can manage that, we like the chances of seeing what could be more sizable moves for the stock in coming sessions. We’re looping back for yet another update on MMEX, which we’ve been mentioning quite a bit after our March 22nd alert gave us the chance to get in at a low of .0046; the stock has since gone on an exponential tear that hasn’t slowed down a bit over the past few sessions. By our update on Friday morning, the stock had made it to just below .017, and that’s when things really took off, with the past couple of sessions providing the most intense spikes yet. We highlighted CYCC as a potential bottom-play in Friday morning’s premarket report, pointing out that it was giving off a strong double-bottom signal along with having previously demonstrated potential for volatility. 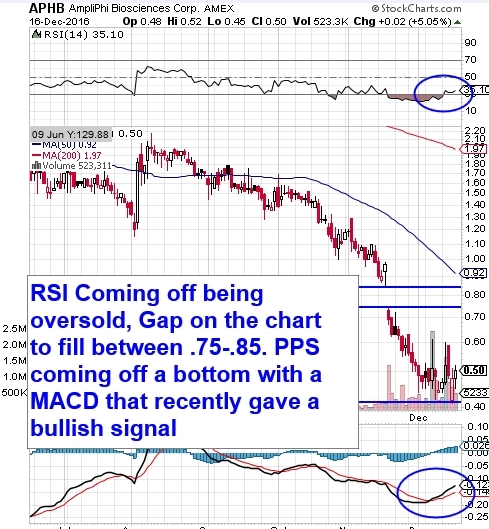 We turned out to be spot on with our calling the stock a prime bottom-play, as it has produced a very impressive two-day upswing since then, with the help of the release of some intriguing study data (>>View News). Our observed range on CYCC since Friday morning is from 3.39 to 6.59, representing a 94% move, while volume yesterday absolutely exploded to the tune of more than 112X its 30-day average volume! It also closed near the high of day so we’re definitely going to want to continue tracking it as the week progresses. Dip-and-rip scenarios could certainly come into play in such a situation. While we’re on the subject of bottom-plays, we want to add a couple more to our radar this morning with Atossa Genetics, Inc. ATOS and Argos Therapeutics, Inc. ARGS. ATOS still appears to be searching for its bottom, so we’ll be watching for that, while ARGS has already begun to get a leg up. We’ll look for a continuation of the establishing trend on that one. We have a new pick coming out tomorrow morning that we’re excited to share with our readers. It operates in the rapidly burgeoning mobile payment processing sector, which is an exciting and forward-thinking space. Be sure to scan your inbox tomorrow between 9AM and the open so you don’t miss out! We just wanted to circle back for our WFM options idea that we submitted last week. We designated contracts with a 02/17 expiration instead of weeklies to give our idea time to develop and it ended up being a good call. Our targets were the WFM 02/17 $30 and 30.50 Calls. Yesterday WFM had a morning pullback which was followed by a nice reversal, and the stock ended up bulling its way into the close near its high of day. The calls we signaled last week had a significant move as a result. The $30 Calls ran from .14-.52 (+271%), while the $30.50′s exploded from .05-.21 (+320%). We are going to want to keep them on our radar for the rest of the week into expiration. Key resistance is at the 200DMA and 50DMA of 30.38 and 30.76, respectively. If WFM can crack the latter, we may look to roll our strike price up and push out another week to contracts expiring next Friday- particularly, the WFM 02/24 $31 Calls. We’ve now witnessed quite a run from GALT over the past few weeks, validating our previous reports on the stock wherein we contested that a serious run-up appeared likely. It began with our report on 01/12, in which we noted GALT’s ripening chart, and surmised that forthcoming gains of 100% were not out of the question. We observed a low of .935 subsequent to that followed by a nice 38% push to 1.29 leading into our most recent report on GALT last Friday. In that report we had this to say “We feel these gains are sustainable if GALT can manage to crack past the current 200DMA at 1.32. As you can see on the included snapshot, the chart continues to bear the look of potential for even further increases“. Yesterday GALT met those expectations nicely with a run to a new high of 1.85, which marks an overall increase from our observed low of 98%, falling just a hair shy of our initial speculations. Yet, our prediction seems to be coming full circle this morning as the stock is gearing up to fill its gap on the chart that we pointed out in our initial report. One more bullish push will get us into double-bagger territory for this idea, and the stock may well make a run well into the 2.00-range. We were quite pleased with the performance of GETH following our featured report yesterday morning, as the stock provided traders with a pair of solid intraday swings amid an onslaught of volume. 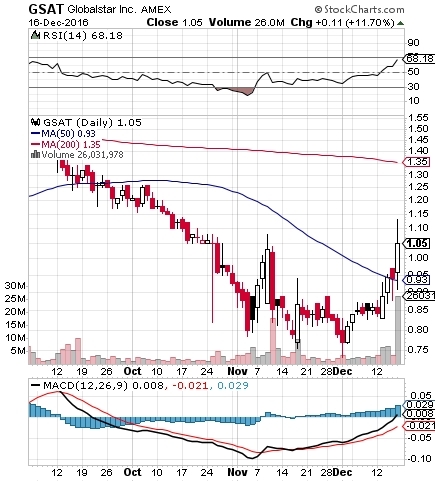 Right from the opening bell, GETH shot up from .165 to the high of day at .235, marking an initial rip of 42% The stock subsequently pulled back to a daily low at .1514, before surging up once more to .215, matching the morning’s 42% gain exactly. All of this useful volatility was accompanied by massive volume on the order of 39X the monthly average, or 19X the 3-month average. It represented an all-time record high for shares of GETH traded in a single session! Yesterday we had identified .15 as the key support level that needed to hold in order to make GETH interesting, and our sentiments in that regard haven’t changed. In our premarket report on Friday morning, we finished off with a set of fresh options ideas for the LLY chain, and were met with nice gain opportunities on the day on all accounts. In addition to a daytrading idea with the LLY Weekly $72 and $72.50 Calls, which worked out in spades, we also got some really good initial movement out of the longer term target we put forth, the 01/20 $75 Calls. We offer congratulations to anyone who benefited from the short-term ideas, and we’ll be sure to stay on the trail of those 01/20 $75 Calls in the weeks ahead. We caught a glimpse of GSAT on our scanner this morning and feel it’s worthy of mentioning, based on a number of factors. Last week, the moves that the stock had been making off of its recent relative lows in the low .70-range began to increase. On Thursday, the stock bullishly breached its 50DMA, culminating in a huge spike in volume on Friday. Roughly six times the monthly average trading volume accompanied a break of the dollar mark. We’re going to put this on watch as a possible momentum play. Speaking of bottom-bouncers, APHB cropped on our scan as well, and it has a look of high potential as it’s coming up off of its recently established annual lows. In addition, there’s a gap to fill on the chart to the upside, and with the stock already trading up in the premarket, that’s a real possibility here. With such a ripe chart, we’ll be very interested to follow APHB’s activity out of the gate this morning.